Elizabeth Ann (Bette) Parsons passed away peacefully with loving family members by her side on Dec. 15. She was 93. Bette shared 66 years of marriage with her loving husband Don prior to his passing in 2013. Her life was devoted to her faith in our Lord, to raising her family of eight children, and supporting Don’s dreams which included his vision to create Communications Test Design, Inc. (CTDI) whose employees then became part of her extended family. The daughter of Martin and Mary Elizabeth McDonough, Bette was born in Philadelphia and grew up in West Philadelphia along with her siblings Kathryn (Kass), Jack and Leo. Bette attended Most Blessed Sacrament School and graduated from West Catholic Girls High School. Following high school, Bette went to work at PSFS in downtown Philadelphia until she met the love of her life, Don, who had recently returned from serving in the U.S. Navy. They began raising their soon-to-be large family in Glenolden prior to moving to West Chester in 1960. Bette and Don enjoyed life after raising their eight children. They loved to travel and had fun with their close group of friends that they all affectionately named the “DOZI’s.” She continued to enjoy her growing family which included 20 grandchildren and 25 great-grandchildren at the time of her passing. Bette was preceded in death by her loving husband Don, siblings Kass, Jack and Leo and great-grandchildren Liam, Aliza and Finn. Celebrating her great life of more than 93 years are the Honorable Donald F. Jr. (Ethel), Dr. Robert (Marilyn), Richard (Claudia), Gerald “Jerry” (Eleanor), Elizabeth A. “Beth” Forsythe, Sister M. Judith Kathryn, I.H.M., Leo (Maryanne) and Christine Bendinelli; grandchildren and great-grandchildren Ann (Bastian) and Etta; Elliot (Melissa) and Owen and Lila; Amy and Luella; Kevin (Lisa) and Alexis, Haiden and Eve; Jessica Minchak (Justin) and Kaelyn and Tanner; Sean (Lauren); Andrew (Kathleen) and Joshua, Drew, Samantha and Jamie; Lisa Kelly (Mike); Brian (Brigid) and Nola and Johnny; Kathryn Montone (Keith) and Sammy, Ellie and Julie; Michael (Christine) and Mary, Sarah and Michael; Rachel; Meredith; Matthew (Megan) and Reagan, Blakely, Louis and Kaine; Mark (Katie); Leo; Megan; Elise; Catherine and Joseph. The funeral Mass was Dec. 21 at SS. Peter and Paul Church, West Chester. Interment was in All Souls Cemetery, Coatesville. 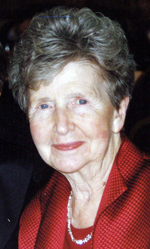 Donations in Bette’s memory may be made to Camilla Hall at IHM Office of Mission Advancement, 230 IHM Drive, Malvern, PA 19355 or to CTDI C.A.R.E.S. (Care, Assistance & Resources for Employee Support) at CTDI, Attention: CTDI C.A.R.E.S., 1373 Enterprise Drive, West Chester, PA 19380. Arrangements were handled by DellaVecchia, Reilly, Smith and Boyd Funeral Home Inc. of West Chester, 610-696-1181, www.DellaFH.com.